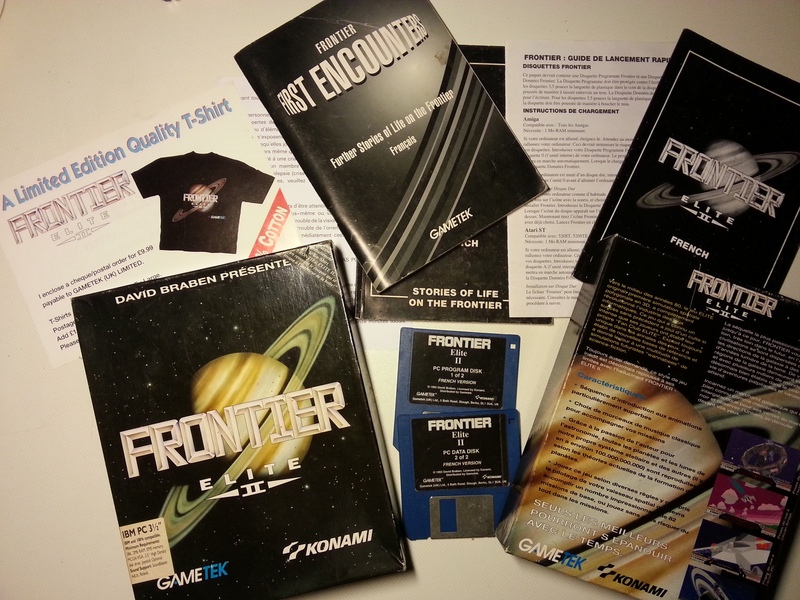 A complete and perfectly preserved original box, of the Frontier: Elite 2 PC game. (I’ve always had the habit of copy right away my tapes / disks / CD-ROM and use the copies). The creator of this mythical game being David Braben , the Rapsberry Pi designer, I can not go my way without making an article about it. When Elite , the first one, was released in 1984, I was 5 years old. My father bought it immediately on MSX , but I never could manage to dock to a spatial base without crashing miserably on its surface. 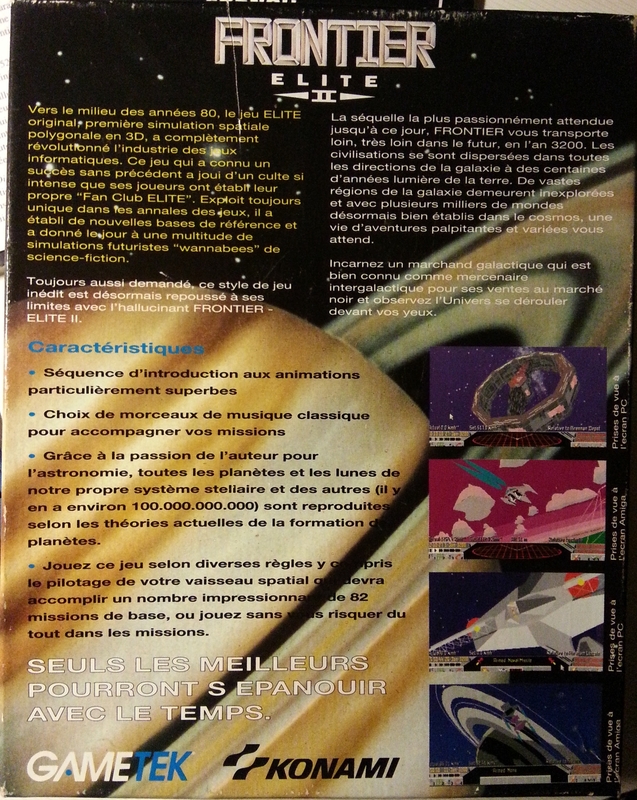 Elite was still the first wireframe 3D video game ! The gameplay was radically new after Arkanoid or Pac-Man ! Nine years later, in 1993, I am 14 years old, I finally own a « real » PC (an old 286 recycled, actually), and a little more trained in the subtleties of playing the keyboard. And that’s good, because station docking in Frontier: Elite 2 is still chaotic (at least for me) ! But it is a treat to walk in space, on the sweet melodies of « Blue Danube » (the one I still remember now). bounty hunter: one of the best jobs that pay, but not necessarily the easiest or the least risky. Here is, in summary, the principle of the three games in the Elite series. No real endgame, you could play hundreds of hours without doing the same thing twice, without going twice in the same system, spending hours to contemplate ugly beautiful planetary landscapes during travel, the autopilot engaged. From Elite 3: First Encounters in 1995 on CD-ROM, which I personally found less exciting, I eagerly await a hypothetical Elite 4. 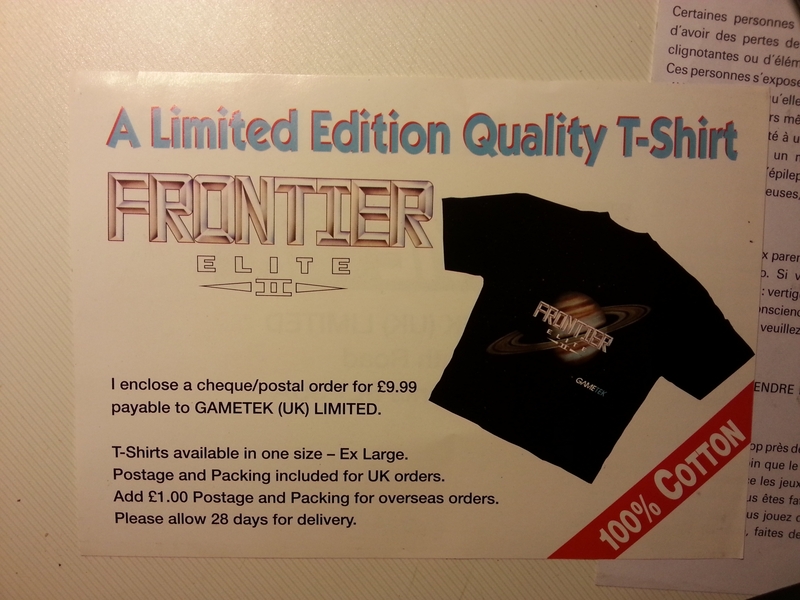 This result was recently announced by Frontier Developments under the name Elite: Dangerous. It will still be playable solo, but also massively multiplayer. Its development was funded on KickStarter and is scheduled for release in March 2014 on PC. do I still have a floppy drive somewhere ? how will I port it on a Raspberry Pi (this is a topic for another article) ? if I do, will I get a kiss from David Braben? Is there still a limited edition shirt for me and where could I ask for it(it would be the best geek thing EVER) ?